eCigs HQ: SmokeTip End-of-Year Accessory Sale! Home » e-Cigarette Special Offers » SmokeTip End-of-Year Accessory Sale! SALE ENDS ON TUESDAY, JANUARY 1st, 2013! 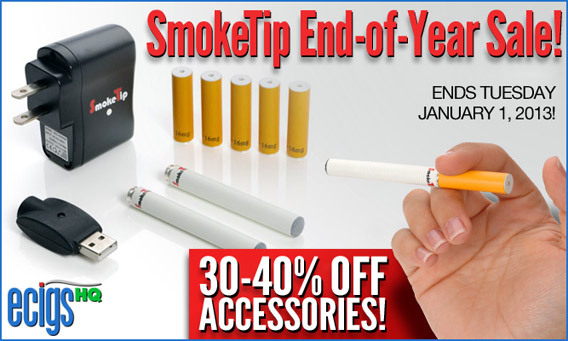 Save 30-40% on your favorite SmokeTip Accessories! Stock up on these essential accessories before time runs out. The SmokeTip End-of-Year Accessory Sale is all about deep discounts on the accessories you need the most. Discounted pricing is now live on the SmokeTip site, so no coupon code is required. Never be interrupted by running out of battery power while vaping — or have to search for a charger ever again. SmokeTip makes it easy to stock up while you save! Reviewed by Admin in e-Cigarette Special Offers | Comments Off on SmokeTip End-of-Year Accessory Sale!